Watch the 3 videos above. Read the information below. Tell 2 people something you learned from the reading. Tingatinga (also spelled Tinga-tinga or Tinga Tinga) is a painting style that developed in the second half of the 20th century in the ﻿﻿Oyster Bay﻿ area in ﻿﻿Dar﻿ ﻿es﻿ ﻿Salaam﻿ (﻿Tanzania﻿)﻿ ﻿and later spread to most East Africa. Tingatinga paintings are one of the most widely represented forms of tourist-oriented art in Tanzania, ﻿﻿Kenya﻿ ﻿and neighboring countries. The genre is named after its founder, Tanzanian painter﻿ Edward Said Tingatinga﻿. Tingatinga paintings are traditionally made on masonite, using several layers of bicycle paint, which makes for a brilliant and highly saturated colors. Many elements of the style are related to requirements of the tourist-oriented market; for example, the paintings are usually small so they can be easily transported, and subjects are intended to appeal to the Europeans and Americans (e.g., the big five and other wild fauna). In this sense, Tingatinga paintings can be considered a form of ﻿"airport art". ﻿The drawings themselves can be described as both ﻿naïve﻿ and caricatural, and ﻿﻿humor﻿ ﻿and ﻿sarcasm﻿ are often explicit. Edward Tingatinga began painting around 1968 in Tanzania (Dar es Salaam). He employed low cost materials such as masonite and bicycle paint and attracted the attention of tourists for their colorful, both naïve and surrealistic style. When Tingatinga died in 1972, his style was so popular that it had started a wide movement of imitators and followers, sometimes informally referred to as the "Tingatinga school". The first generation of artists from the Tingatinga school basically reproduced the works of the school's founder. In the 1990s new trends emerged within the Tingatinga style, in response to the transformations that the Tanzanian society was undergoing after independence. New subjects related to the new urban and multi-ethnic society of Dar es Salaam (e.g., crowded and busy streets and squares) were introduced, together with occasional technical novelties (such as the use of perspective). One of the most well known second-generation Tingatinga painters is Edward Tingatinga's brother-in-law, Simon Mpata. Characteristics: Theses paintings came from the African tradition to decorate the walls of their huts. Most of the work includes animals and vegetation found locally in Africa. Common animals found in paintings include the “Big 5” – lion, elephant, giraffe, hippopotamus, and antelope. Animals are often posed in awkward stances or intertwined. The animals are painted bright colors and may contain natural or unnatural patterns. Outlines are drawn around the animal. The backgrounds often are colors that fade one into another. Test Pattern - Start by creating a test pattern. Below is a close up image from a Tinga Tinga Painting. On the square provided, lightly draw that pattern and paint it trying to match the colors as close as possible. You are trying to repeat the image as close as possible. Once you have completed the sample, Take a photo and send it to Schoology. After researching Tinga Tinga painting, please create 3 or 4 quick sketches of different ideas. ​ This is the planning stage so all ideas can be modified. Think of several colors to fade into each other for the background. If needed, make some test blends. Not all colors look good when mixed together. You may also choose to do an African landscape with grasslands and sky. Divide your background using 1/3 sky and 2/3 land (or vise versa). You can add a few Baobab trees in the landscape or branches and leaves across the top of the sky. Choose 1 - 3 animals as the centerpiece of your painting. Pose them in unusual or awkward positions or intertwine them in some way. Look at patterns and colors that you may want to use. Draw a few test patterns. 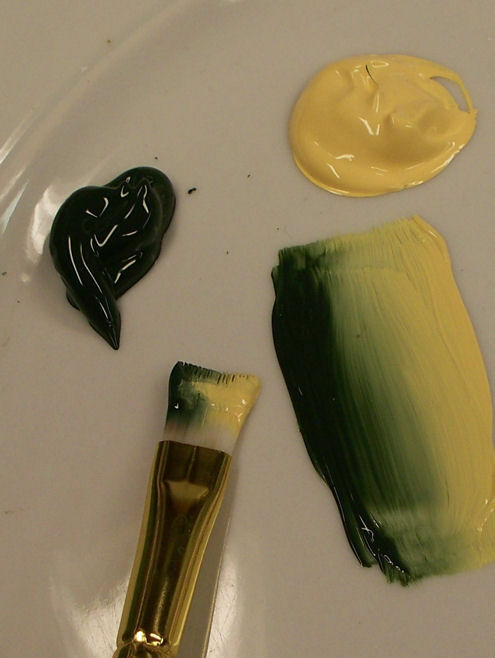 Paint the background so that it fades from one color to another (Use up to 4 colors). Paint horizontal stripes of your first color across the paper beginning at the top. Leave a half inch between the first and second stripe and paint your second color. Leave a half inch stripe unpainted and continue with your next color(s). The width of the painted stripe depends on how many colors you plan to use. The more colors the skinnier the stripe. Begin with the first two colors at the top of the paper. Double load a wide paint brush with one color on one side and the 2nd color on the opposite side. Place the paintbrush over the top empty stripe with the matching color below it. Begin brush across the blank stripe, moving the brush up and down slightly so that the two colors blend together. Fill in animals with any type of pattern. Dots are commonly used, but you may also use the animals natural patterns (like stripes for zebras). Go back over your work and look for areas that need improvement. This would includes things like erasing pencil lines, fixing painting mistakes, etc. Ask a friend if you need to add or fix any areas.